Human exposure to electromagnetic fields (EMF) is nothing new. But the technological explosion that happened in the last century and which shows no signs of stopping in this century has significantly increased our exposure to human-made electromagnetic fields. These days everyone is constantly exposed to a variety of both magnetic and electrical fields at home, work, school, and everywhere in between. Everything from the generation and transmission of electricity to household appliances to personal electronic devices contribute to the problem. Small electrical currents naturally exist in our bodies – generated by chemical reactions that happen as part of our normal body functions. All the nerves in your body send signals by transmitting electric impulses. Almost every biochemical reaction – everything from brain activity to digestion – includes rearranging charged particles. Even your heart utilizes electrical activity – as is measured by an electrocardiogram and in some cases regulated by a pace maker. Because we have all that electrical activity going on inside us, low frequency electric fields can affect our bodies just like they can anything else composed of charged particles. Studies show low frequency magnetic fields cause circulating currents inside our bodies. The power of these currents is dependent on the strength of the exterior magnetic field. If they are big enough these currents can stimulate your muscles and nerves, or even impact other biological processes. You can use an EMF meter to detect and measure electromagnetic fields. No one disputes that electromagnetic fields at higher levels can trigger adverse biological effects. But scientists and medical professionals are diligently studying and debating whether or not low-level exposure to EMF radiation is harmful. Given the proliferation of WiFi, cell phones, and other devices giving off EMF radiation, it is a question that needs to be answered. While the scientific community grapples with the questions, many people find themselves at the front lines of the debate due to increased EMF sensitivity. If that is you, finding various ways of EMF protection for yourself and your loved ones is of primary importance. There are a variety of protective products and devices available – everything from Faraday products, Laptop Radiation Shields, EMF Protection Pendant Necklaces, and negative ion bracelets to EMF shielding bed canopies , EMF protection clothing, and radiation absorbing plants. Protecting yourself isn’t just about items that block EMF radiation. There are also low EMF versions of many products – everything from low EMF hair dryers, air tube headsets, and far infrared heating pads, to low EMF infrared saunas. Making the right choice on which ones you purchase can have a significant impact on the amount of EMF radiation you and your family are exposed to. It is important to recognize that there are beneficial aspects of electromagnetic force as well. Pulsed Electromagnetic Force therapy (via PEMF devices) has been shown to be very helpful for some people in alleviating various pains and emotional issues. 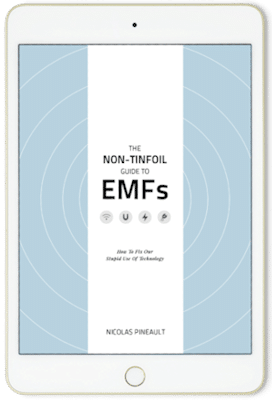 Our goal at EMF Risks is to offer information about the potential dangers of EMF radiation, and also practical ways to shield yourself from its effects. That includes practical tips on how to manage your home in the healthiest way possible, along with reviews of products that are low-EMF alternatives to necessary items.